During May and June of 2016, the Wasatch Front Regional Council (WFRC) staff, along with the Utah Department of Transportation (UDOT), Utah Transit Authority (UTA), and key stakeholders met with local communities to gather input regarding goals for future land use plans, specific transportation needs, and economic changes within their area of the Wasatch Front region. In order to better facilitate the conversations with the local communities, the region was divided into ten sub-regions made up of five or six communities with similar land use and transportation needs. Invitations were emailed to elected officials and key staff within each municipality making up each small area. Prior to the sub-region meetings, each invitee was emailed a link to an online interactive story map, and was asked to come to their respective meeting prepared to discuss future needs within their community. WFRC staff created a series of online interactive story maps developed specifically for the entire region and for each sub-region along the Wasatch Front. The story maps provided a robust data set of historical trends and existing conditions, including how land is currently used, transit use, active transportation routes, job and education accessibility, transportation and housing costs, etc. 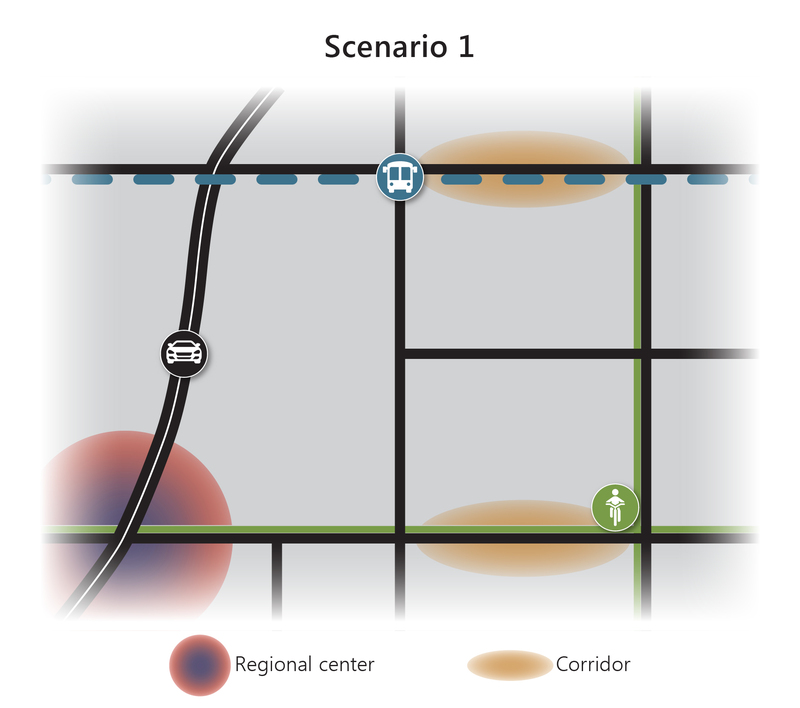 The maps were used throughout the visioning and outreach process of the Wasatch Choice 2050 (WC2050) Vision and 2019-2050 Regional Transportation Plan (RTP) to provide spatial information regarding key transportation and growth-related topics in the area. The data visualization tool was used to prompt stakeholders to look forward and envision desirable ways in which the area could grow over the next 30 years. From this outreach, WFRC created three land use and transportation scenarios to be tested and compared through a broad set of ten quality of life performance measures. 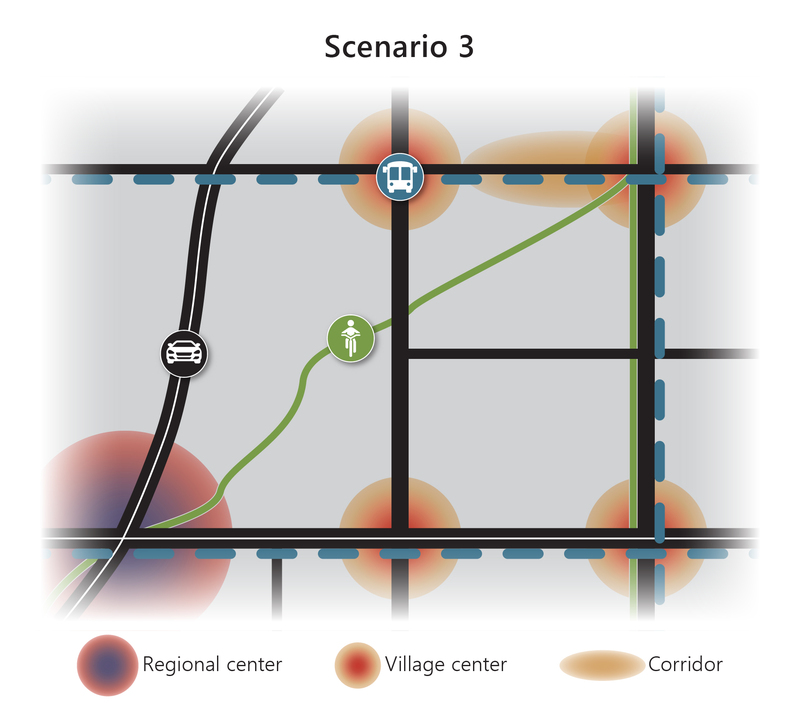 The information gathered from the first round of sub-region meetings was used to develop three unique land use and transportation scenarios. WFRC, in close collaboration with local communities and transportation partners, developed three scenarios that articulate the trade-offs associated with different transportation and land use investments. The WC2050 process will explore future scenarios that articulate the approaches to growth associated with different transportation and land use investments. These trade-offs will be evaluated in each part of the region, with stakeholders actively engaged in the process to select the appropriate path forward. The future based on current plans and trends. This scenario included all projects within the 2015-2040 RTP and incorporates all currently adopted city and county general plans. Land use was extrapolated from local general plans and zoning out to 2050. Roadway improvements had an emphasis on east-west road widenings and connections. Two new freeways and additional capacity on existing freeways were planned. Transit included a mix of capacity and service projects. All transit routes ran every 15 minutes, except FrontRunner, which ran every 30 minutes during peak times and 60 minutes throughout the day. Active transportation included the build out of the Regional Priority Bicycle network of connected active transportation facilities. Focuses growth in large regional centers and expands local streets and regional rail. This scenario concentrated future population and employment growth in regional centers strategically placed throughout the region. Because the centers are larger, the transit system improvements are more focused on high-capacity rail and fixed bus lines. All transit routes ran every 15 minutes, including FrontRunner, during peak times and then 30 minutes throughout the remainder of the day. The roadway improvements are focused on linking communities by connecting roadways and improving access over barriers with additional operational improvements. Active transportation focused on bicycle network improvements located within one and a half miles from regional centers and transit stations. 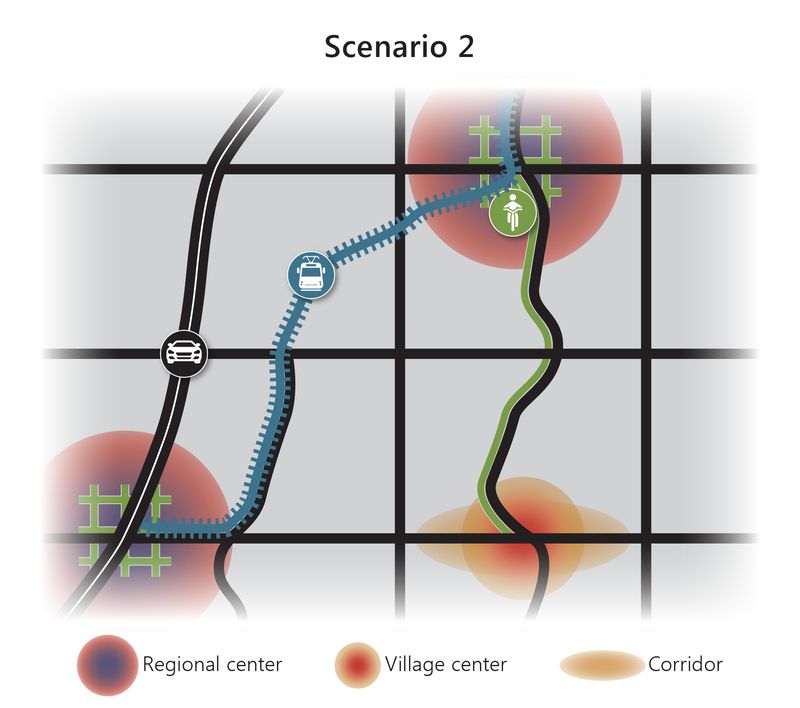 Creates small village and town centers while expanding regional roads and local buses. This scenario had a focused land use with well-dispersed town and village centers. Roadway improvements included capacity improvements on existing roads both east-west and north-south to reduce travel times and improve traffic flow. Because the centers are more dispersed, the transit system improvements are more focused on bus service, including additional routes, increased frequency, and expanded service throughout the day. All transit routes ran every 10 minutes, except FrontRunner, which ran every 15 minutes. Active transportation focused on trails and protected bike lanes to increase separation from vehicles for bikes and pedestrians and to enhance user safety. To learn about the scenarios that identify investments regarding the future of your community over the coming decades, please click on the appropriate button below.